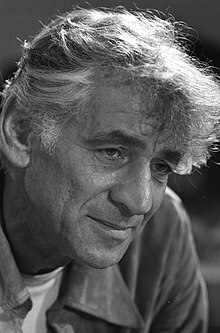 ↑ "Leonard Bernstein, 72, Music's Monarch, Dies". New York Times. October 15, 1990. สืบค้นเมื่อ 2009-02-11. Leonard Bernstein, one of the most prodigally talented and successful musicians in American history, died yesterday evening at his apartment at the Dakota on the Upper West Side of Manhattan. He was 72 years old. Mr. Bernstein's spokeswoman, Margaret Carson, said he died of a heart attack caused by progressive lung failure. หน้านี้แก้ไขล่าสุดเมื่อวันที่ 23 ตุลาคม 2558 เวลา 03:15 น.